If you want to send a video to computer users with limited technical knowledge you usually have to consider that they might not be able to play it if you send it in a video format that is not supported by default by their operating system. There are three possibilities for this situation. Number one is to upload the video to a video portal and send the link to the video instead of the video to the recipients. This ensures that they can watch the video if they have a web browser with Adobe Flash installed. The second option would be to install a compatible video player on their computer system to make sure they can play the videos that you send. The third and sometimes most convenient option is to use a program like Make Instant Player to combine the video with a video player that is capable of playing the video. The last option results in an executable that contains the selected video. 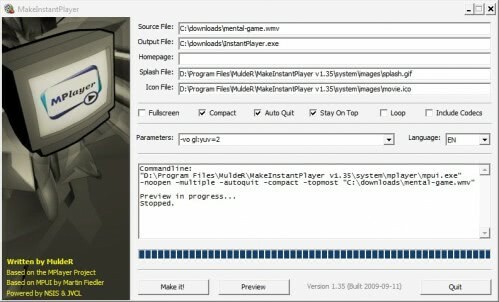 Make Instant Player is a free software program that combines the popular video player MPlayer with a selected video from the computer system. The user only needs to select the video from the local computer system to convert it into an executable that can be played regardless of codecs installed on a computer system. Several options are provided to customize the output. The user can choose between fullscreen and compact mode, make the video auto quit after playback, make it stay on top or loop. The include codecs option is only needed for some video formats like wmv or Real Player but not for the majority of formats available. It is possible to preview the video before starting the conversion. The only problem that might occur after sending the executable to recipients might be their reluctance to click on an executable file that has been send to them. But that's probably quickly sorted out with a phone call, in person meeting or explanations in the emails. This is a cool program. I’ve used it for a while, and you’re right Martin, the only downside is the general hesitation towards exe files. Rightly so. I find that it’s always good to include the original md5 in any instructions. I’ve found it to be the most useful for small photo slide shows but has use in tutorials also. The photo slide show thing is great for sending pictures to my mom so all she has to do is click.